The story of the Bloxwich Lion is something that has passed into legend amongst local folk, told and re-told down the generations, with bits and pieces remembered, sometimes mistakenly, until it has at times become twisted and tangled. Strangely, the tale of the lion which escaped from Pat Collins’ Wakes Ground has never been recorded as such in the town archives. But now, the legend is a legend no more. The Bloxwich Telegraph is able to finally set the story straight and place it properly on record, thanks to international (yes, international!) research by Stuart Williams. It’s timely, because there is a good chance that the Bloxwich Lion will now be recognised in a new public artwork, of which we hope to say more once details are confirmed. Watch this space. It may well seem peculiar that the legend of the Bloxwich Lion has never found a place in the archives, but that’s really just because the computer era has not yet reached our local historic newspapers, and there are no detailed indexes of such things locally. Moreover, the whole story has never been properly researched until Stuart Williams got his teeth into the lion’s tale. Astonishingly, the necessary evidence to shed light on the whole kitty and caboodle has been easier to discover on the other side of the world, in the online newspaper archives of the National Library of Australia. And that was where Stuart found the first documented story of the lion that upped sticks and went for a walk in Church Street, one dark night in 1932. In digitised news-cuttings from The World’s News and The Delegate Argus of February and March of that year respectively, Bloxwich found world fame on the opposite side of the globe, thanks to the wanderings of an errant big cat and his adventures amongst Bloxwich folk. The press trail of those big furry footprints led back from the antipodes to The Times newspaper of London, where the international story originates, and by narrowing the date down, the best and most detailed reports of all have now been discovered in the Walsall Observer and Walsall Times newspapers of February 1932. In addition, another local investigator, with online access to the Express and Star of the day, Mr Chris Selby, also kindly came up with the picture shown below. As the Walsall Times pointed out not long after the event, many conflicting stories of the visit of an escaped lion to not one (as was previously rumoured), but two houses in Church Street, Bloxwich, were being circulated even back in the day, and there is some slight confusion between the details in the the national, international and local reports. If in doubt, we have therefore tended to give most credence to the detailed report in the Walsall Observer, which was the town’s top local paper for almost 150 years. However, the facts of the matter are basically that, on the evening of Saturday 6th February, 1932, Pluto, as the lion’s name was subsequently revealed in the Walsall Observer, managed to escape from his travelling cage on Pat Collins’ showground (also known traditionally as the Wakes Ground), which then was situated where the Asda car park now resides. He managed to climb over the wall between the ground and Church Street, somewhere at the back of the Grosvenor (later Odeon) Cinema (now The Bloxwich Showman pub), of which more later. But this is just the beginning of what is a convoluted and rather entertaining tale. Pat Collins’ Wakes Ground, now the Asda site, 1949. We now know that the first fortunate (!) recipient of a house-call from the fierce feline that night was in fact Mrs Amy O’Connor of 120, Field Road, who, it seems, had been intending to visit her father-in-law’s house in Church Street. Just as she arrived in the back yard, she saw a shadowy figure which she took to be a man coming towards her. Taking hold of the figure’s head, she then had the shock of her life as she found she was handing a lion! Mrs O’Connor, understandably startled, managed to pull herself together and got into the house. The lion followed her in briefly, but thankfully went out again, whereupon Mrs O’Connor slammed the door to keep it outside. As soon as she had recovered from the initial shock, she had the presence of mind to run straightaway out of the front of the house and thence to Bloxwich Police Station, in the Public Buildings on Elmore Green Road, where she reported the matter to the police. She also went round to the showground and, finding the owner of the lion, reported it to him. The young German lion tamer returned with her, but by then the lion, Pluto, had moved on. Pluto, who obviously had strong hunting instincts despite being kept in captivity since being brought over the sea from Africa, had decided to try his chances elsewhere, and had padded softly around the back of the O’Connor house and ended up behind number 36, the home of Mr and Mrs James W. Parsons. So it was that, as Mrs Parsons was emptying a teapot at the back of the house around six o’clock, she received the evening’s second close encounter of the kitty kind. She had been expecting a visit from a young girl, and called out “Come on Milly!” when she saw movement in the shadows, but instead she was more than a little surprised to suddenly see a big, hairy-maned lion strolling confidently up to her and into the light. It uttered a terrifying growl. Screaming, she promptly dropped the teapot and ran into her home, followed swiftly into the scullery by the big beast. Mrs Parsons did the most sensible thing and ran through into the sitting room, where her husband was sitting at the table enjoying a cup of tea. He wondered what was going on and went to the door leading to the kitchen, looking out and getting his first glimpse of the mighty moggy. For a moment, he braced his back against the door, but realising the futility of this mode of defence, he followed the example of his wife and made a hasty exit into Church Street by way of the front door, which he shut after him. At this point, Pluto had the house to himself, with the front door closed and the other doors open, and if he had thought to take it an escape route was available back through the scullery and the yard door. The plucky Mr Parsons wasted no time, swiftly obtaining the assistance of his neighbours Messrs Sam Heeley, J. Rowe and especially, a young Mr Jack Russell, with whose assistance the back door was shut. They could then see Pluto walking to and fro between the sitting room and the furniture-filled parlour, and resting awhile on the hearth rug in front of the fire while they were shut out in the cold. Finally, when he disappeared one last time into the parlour he inadvertently partly closed the door after him with his tail, and the men, watching for their chance, ran in and shut the parlour door. The heroic Jack Russell, acting much like the fearless and feisty dog of the same name, meanwhile secured the parlour door with a rope and hung onto it to ensure the beast stayed put, to avoid its roaming elsewhere in the house. That is more than most would have done, for an ordinary door as the only barrier between one and a lion is not the thing to inspire a feeling of freedom from danger. The men went on to barricade the front window with a door removed from the coalhouse, to avoid the lion breaking out that way. However, while the humans had been running around like meerkats, and hundreds of locals had gathered in the street outside, the majestic lion had already had some fun in the parlour, breaking a picture and a small glass vase and savaging Mrs Parsons’ fur necklet and the fur on her coats, which had been left hanging on the back of the door. In getting at these, he tore the coat hook off the door (on the other side of which was Jack Russell hanging onto the rope for grim death). Pluto also left a huge paw print on the sideboard mirror, and a few deep scratches to accompany it, perhaps having seen the reflection of what he thought was a competitor! Apart from this, and a little damage to the stair carpet, Pluto offered no violence during the incident, which was just as well for both sides. The Bloxwich police, by now having arrived after Mrs O’Connor’s earlier alert, were probably a little out of their depth, to be fair, as they were far more likely to encounter a Staffordshire Bull Terrier (or indeed, a Jack Russell) with a drunken owner in the course of their daily duties in the village than a top predator from the South African veldt, but they proceeded to render every assistance they could to control the crowd of hundreds of locals and to help get Pluto back in his own ‘parlour’. The Express & Star says that Mr Parsons told their reporter afterwards “…people had assembled in the street, and, probably frightened by their noise, the beast roared, and I could hear the sound of breaking glass in the room. It took the police all their time to hold the huge crowd back.” Thanks to the gentlemen of the press, and the London Times, who thought to report the event, that roar was eventually ‘heard’ round the world. Pluto’s owner and trainer, a young German lion tamer named Herr Robert Lier, who was working with Pat Collins and wintering at his Bloxwich showground, joined forces with the police and locals and together they began making efforts to recapture the lion. Pluto’s travelling cage was fetched from the Wakes Ground on a lorry, and backed right up to the front door of number 36, whereupon the trap door grille at the end of the cage was raised and the front door of the house forced open, presumably using a pole of some kind. As soon as the lion saw his full-grown lioness looking disdainfully at him from within the cage, he walked quietly, and perhaps somewhat ruefully, back into captivity and the trap door was immediately closed. His short-lived freedom was at an end. Pluto then turned round and stared at the assembled crowd of Bloxwich folk, regarding them with utter amazement. It must have seemed to him like a Saturday night at the Pat Collins Lion Show, with all those curious and perhaps a little fearful faces peering in at him and his missus. No doubt he wondered what all the fuss was about! There are a few strange coincidences relating to this case. Just a few days earlier, it seems, Mr and Mrs Parsons had been joking with relatives about the chances of them becoming famous in the national newspapers. Also remarkable, under the circumstances, was that, also a few days earlier, a visiting relative, hearing the roaring of the animals in their cages on the Wakes Ground on the other side of the wall, had suggested they better be careful lest one of the lions escape and find their way into the back yard! Mr Parsons, talking to a Walsall Observer reporter after the event, laughed heartily with hindsight at the coincidence, but it had probably not been quite so funny at the time! Oddly enough, it further turns out that he was a member of the Cheslyn Hay Male Voice Choir, and they had only just started learning a new piece the week before, entitled ‘Martyrs of the Arena’, when the conductor, Mr Ernest Amphlett of Wednesbury, had suggested that they wanted to get the ‘…right atmosphere and colour for the fearsome passages…’! Little did Mr Parsons think that he was going to get the atmosphere right quite so soon, but when he went to choir practice on the Sunday he was sought after by other choir members seeking his views as to the proper feeling to express when confronted by a lion… Perhaps as a result of Pluto’s unexpected visit, the choir went on to win first prize for their rendering of the piece at Shrewsbury the following Thursday! But how had Pluto gotten free in the first place? Well, it turns out that whilst the cage door was open for feeding time, Pluto had taken his chance and leapt out and over the wall at the Church Street side of the Wakes Ground. This is the stuff of which legends are made. Unfazed by all the attention in Bloxwich, Pluto and his mate later went on to wow the crowds of Birmingham at the Bingley Hall, where they were put inside a large ball-shaped metal enclosure, around the inside of which their owner, Herr Robert Lier, rode a motorcycle. Herr Lier, speaking only broken English, gave his account of the Bloxwich incident to the Walsall Observer, and revealed that in the nine months he had been in England he had had very bad luck, but he was now, however, hoping for better times! All in all, it had taken nearly two hours to recapture the Bloxwich Lion, and as a result of all the hoo-hah and subsequent gossip, not to mention local, national and international press coverage, Pluto, whose name was sadly forgotten until now, has long since passed into local legend. While he was enjoying his adventures in Church Street he gave, indeed, a roar which was undeniably heard round the world, from Bloxwich to Australia, and probably beyond! A borough wide project set up to celebrate 25 years of delivering community arts in Walsall has drafted in renowned Beano artist Hunt Emerson to help design 11 unique tapestries. The ‘Silver Thread’ project involving an army of local people will see 11 unique tapestries created representing the six towns and other areas in Walsall Borough. Reflecting the borough’s living history the tapestries will show the diversity while acknowledging the past, reflecting the present and embracing the future. A successful £73,400 Arts Council England Lottery Funding bid is allowing Walsall Council Creative Development Team to deliver the unique year long community arts project which will involve an army of local people. The tapestry aspect of the project is aimed to provide a common thread of arts and local history and runs alongside work to produce a commemorative book featuring 25 of Walsall Council’s Creative Development Teams most notable projects. 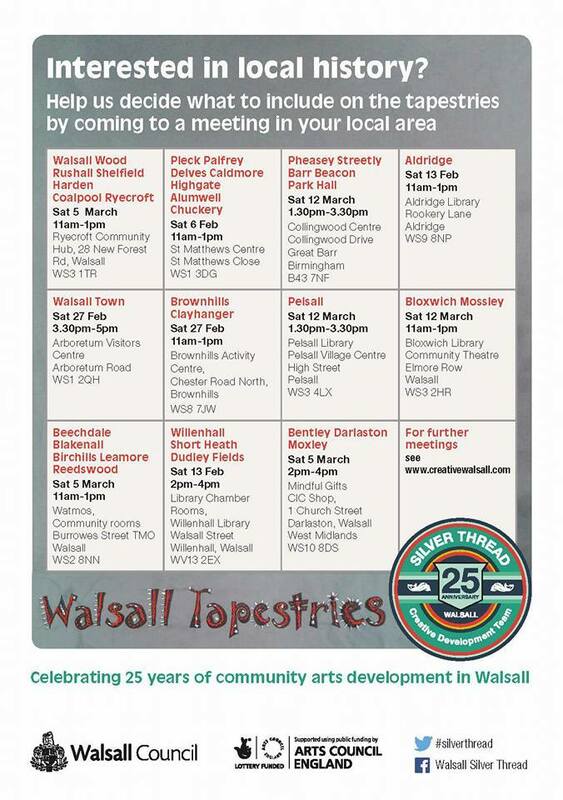 The first meeting dates have been set for local people to help decide what will be included on the tapestries. Walsall Council Creative Development Team are inviting anyone who has an interest in local history, local Identity or to find out more about the project to come along to a meeting in different localities across the borough. The project’s first sewing group, Arboretum Craft Group, left to right: Colette Mumford, Yvonne Thomas, Beth Porter, Eunice Kirby, Joyce Lilwall, Lynne Tandy & Sue Collingwood. Walsall’s new ‘Silver Thread’ project is a great new local community project organised by the Walsall Council Creative Development Team. It celebrates both local history and arts, and 25 years of work by the Team (which will itself be marked with a new book). There will be local meetings in many places across the Borough to involve local people with the project on the history, arts and crafts front. Many local towns and villages are being represented in a series of ‘tapestry’ works which will be created. Anyone interested in their local history (including in living memory) or who was involved in the past local manufacture of needles and awl blades (for which Bloxwich is historically famed), or who is a keen sewer or in a sewing group, will be particularly welcome. Arboretum Craft Group are the first sewing group to sign up to help sew the Silver Thread Tapestries. Also, contacts are invited by the organisers from people who have been involved with past Creative Development Team projects like The Bloxwich Tardis on Elmore Green, or The Brownhills Miner! It is not generally known that Bloxwich possesses one of the oldest and most complete monuments in the Midlands – although it is of two different periods – and it is certainly the oldest thing in Bloxwich. The old preaching cross or column standing in All Saints churchyard, on the south side close to the church itself, has been an object of curiosity to generations of parishioners. We may safely designate it as a cross, since by no means all old crosses conformed to the true cruciform shape. But this cross is far older than the church itself, being probably the oldest monument in the borough, and is very important. Throughout the Middle Ages, Bloxwich was a small agricultural village with a population of around 600. A Chapel of Ease to Walsall Parish Church was licensed for services at Bloxwich in 1413, but Bloxwich did not have its own separate parish until 1842. The chapel had a tower by the 1500s. In 1790 it was decided that the chapel should be rebuilt and the tower altered. This work was completed in 1794. All Saints Church as it is today dates mostly from 1875-1877 when the earlier church, St. Thomas of Canterbury (named such for the original 1842 parish), was rebuilt and rededicated. No records of the cross appear to have survived, nor was any indication of its full age discovered on it when it was restored in 1935. We are therefore thrown back upon the opinions of experts. All authorities are agreed that the practice of erecting such crosses goes back to the earliest days of Christianity. Sometimes, in English villages, they were set up on the spot where the Gospel was first preached. As time went on, according to historians, the south side of every churchyard contained a cross. Though not of the usual form, the cross itself consists of an eight-sided shaft, slightly tapering towards the top, and terminating in a later Jacobean capital surmounted by a Jacobean ball, both of the early 1600s. It is mounted on a base of three stone steps. He also noticed that at one time the centre of the steps had been clamped with iron staples, but these had rusted away except for the portions which were leaded into the stone. An attempt to repair the clamping on the top tier had been made, but given up by the repairer as he had only been able to drill to a depth of three quarters of an inch. This coming festive season, which is not too far away, perhaps readers of this article, whether Christian or not, might like to go and stand by the old Bloxwich Preaching Cross and reflect for a moment, as Billy Meikle may have done before them, on what Christmas may have been like for their ancestors all those centuries ago when there was no church, and no traffic to disturb their quiet Yuletide contemplation. Bloxwich was once particularly rich in old public houses, many dating to the Georgian era and before. By the time local historian Billy Meikle (1858-1943), who spent most of his life in Walsall, wrote about the old Bull’s Head pub in Park Road, Bloxwich, few such early inns remained, and today many surviving Bloxwich pubs are sadly closed, converted or under threat for economic reasons. The original Bull’s Head inn had been in what was later named Park Road, Bloxwich, since Tudor times. The name of the pub is traditionally said to be inspired by the bull’s head which was part of the coat of arms of John Skeffington, a Bloxwich landowner of the 1500s. However there was once a long tradition of bull-baiting in Britain, and pubs of this name often refer to this now-extinct blood sport, so there may also be an element of this in the origins of the name. The Bull’s Head was for centuries a thriving social centre and a popular meeting place for local workmen. Indeed the ‘Amicable Society’ – the town’s largest friendly society – met there from 1785. They had seventy-two male members and by 1811 there were forty women on the register. A Catholic Society also met there in the early 1800s, with Titus Somerfield as secretary and a membership of 260. William Colbourne owned the Bull’s Head in 1813. By 1818 Thomas Taylor had taken over, and was still there in 1834. In 1851, Samuel Taylor was the licensee but by 1880 it had changed hands again. William Fryer was the landlord in 1908, by which time the weekly takings were £11 and four shillings. Though latterly having a plastered Victorian façade added, by the time Billy Meikle came on the scene in the early 1900s the pub still retained its ancient oak beams, an ingle nook and an 18th century fireplace, giving it a cosy atmosphere. In 1938, Meikle wrote that forty years ago the Tudor fire grate had been removed. The old Bull’s Head was much-loved, both by locals and by Meikle, who photographed the pub, together with its last landlord Arthur Banks and his wife, on 10 June 1927, not long before it was demolished by Walsall council. The modern Walsall Metropolitan Borough is a substantial area housing around a quarter of a million people. But it was not always so extensive, or so populous! 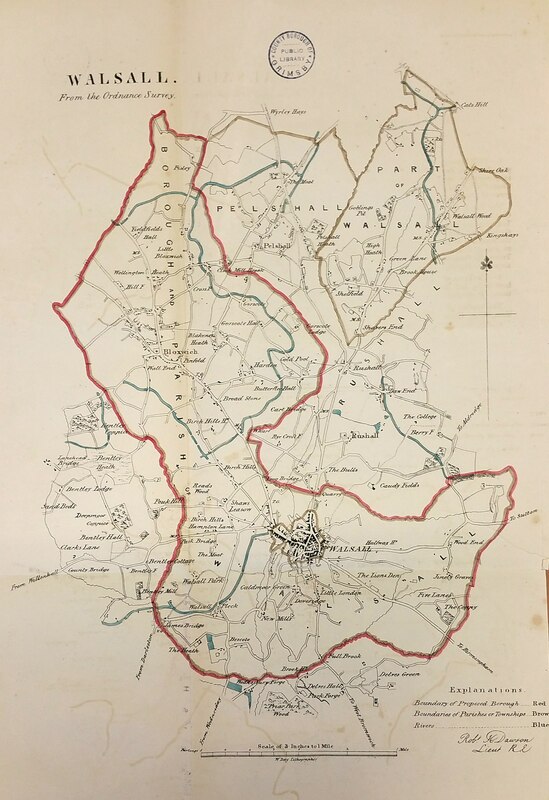 In 1831, the old Parish of Walsall, at that time divided into the townships of the ‘Borough’ and the ‘Foreign’ for the purpose of collecting the Poor Rate, included just 15,066 people. But what were the Borough and Foreign? Simply put, the Borough was the old town itself, the rough equivalent in size of modern Walsall’s town centre. Today, it would not take you long to cross it on foot – if you got off the bus outside The Prince pub in Stafford Street and walked south to the Wheatsheaf pub in Birmingham Road, you will have travelled across the town of Walsall: the old Borough. The Foreign was every place within the old Parish of Walsall but outside the Borough. In those days, when Bloxwich had a chapel of ease but no parish of its own, the Foreign primarily included such places as Bloxwich (the effective centre of the Foreign), Little Bloxwich, Blakenall Heath, Leamore, Birchills, Shelfield and (albeit semi-detached) Walsall Wood. It also included such smaller locations as Pleck, Caldmore, Chuckery and Palfrey. Rushall, Pelsall, Brownhills, Aldridge, Streetly, Bentley, Darlaston and Willenhall, which were not part of the old Borough and Foreign, did not come under the administration of Walsall until the mid 1960s-70s, which changes caused some controversy within those towns and villages. The present Metropolitan Borough itself (preceded by the County Borough) came into being on 1 April, 1974. The rivalries between these later additions and Walsall itself were foreshadowed by the long-standing feuding between Bloxwich and Walsall, which despite their distinctness and one-time geographical separation before the surrounding areas were filled in with houses, shops and industrial development, are thought to have been historically associated for almost 1000 years. In practice, the separate identity of the Foreign or ‘forren’ goes back at least as far as the 13th century, when the Ruffus Charter of c1225 mentions the ‘forin woods’, and a lease of 1485 refers to ‘the Manor of the Forren of Walsall’. Bloxwich (Blocheswic in Domesday Book, 1086) or ‘Bloc’s Village’, existed before the Norman Conquest, as part of the Anglo-Saxon Kingdom of Mercia, when the Mercian family of Bloc settled there. In 1162, the Manor of Walsall was granted to Herbert Ruffus by King Henry II, Bloxwich being included as part of the Foreign of Walsall. Medieval Bloxwich, a small agricultural village, population c600, expanded in the 1700s with coal mining and cottage industries. From the 1400s, Bloxwich had a chapel of ease within the parish of Walsall, but no separate parish until 1842. Originally dedicated to St. Thomas of Canterbury, All Saints Church dates mostly from c1872-5 when it was rebuilt. A 13th century preaching cross stands in the churchyard. A workhouse on ‘Chapel Green’ (now Elmore Green) was open by 1752. It was on the site of the present car park. 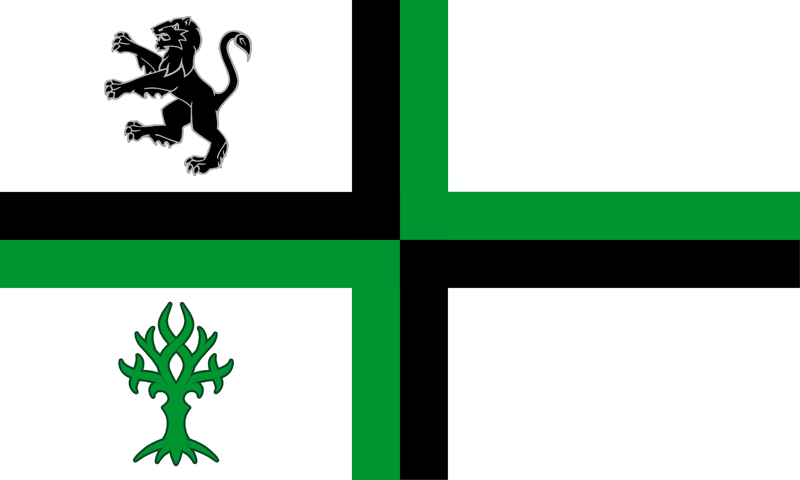 From the mid-1600s, a rivalry built up between Bloxwich and Walsall, when during the English Civil War Bloxwich was Royalist and Walsall Parliamentarian in sympathy. This traditional rivalry, now (usually!) more friendly, has continued down the centuries. By the early 1800s Bloxwich was surrounded by canals, allowing goods to be transported more easily, encouraging expansion. The village became justly famed for its light metalwork and especially ‘awl blades of Bloxwich repute’. A monument to the ‘bitties and tackies’ of Bloxwich, a mound of anvil stones, is in Bloxwich Park (the village green) and a Victorian fountain is in the Promenade Gardens. Interesting buildings, apart from the largely Victorian High Street, include amongst others Bloxwich Hall, built 1830, restored as offices in the 1980s and Bloxwich Hospital, formerly ‘Manor House’, built c1850 and made a maternity hospital in 1928, now offering mental health services for older people. Eden Florists (the ‘Cottage Shop’) has 1400s foundations. The 1832 Methodist Chapel in Park Road has since the early 1900s been a cinema, garage, factory and retail unit. 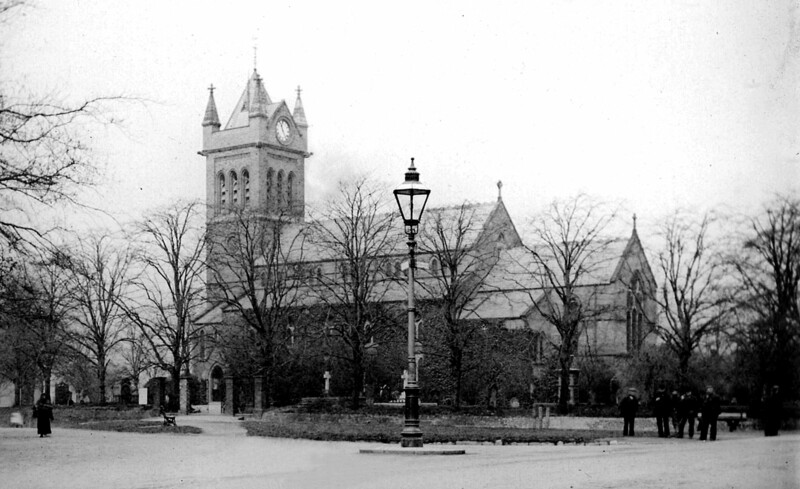 Its 1864 successor was replaced in the 1960s by St John’s Church. A splendid Victorian villa, ‘Bellfield’, is situated in Stafford Road. And, close to the Bloxwich boundary on the A34, is Yieldfields Hall, a haven for Roman Catholic recusants from the mid-1600s onwards. Bloxwich High Street in 2013. Bloxwich Wesleyan Church was demolished in 1963 for a TESCO store which later had other uses, and is now a furniture store. Bloxwich is noted for its historic pubs, dating from the 1700s-1930s. Those currently open include the Royal Exchange, Turf Tavern, Romping Cat, Bell Inn, Wheatsheaf, Spotted Cow, Spring Cottage, Hatherton Arms, Prince of Wales, Lady Diana, Lamp Tavern and Sir Robert Peel. The Georgian ‘George’ is now a hardware store. Modern pubs include the Queen’s Head, Magic Lantern and One Man and His Dog, and at Little Bloxwich the Beacon Way and Saddler’s Arms. Fairground and cinema mogul, Liberal councillor, mayor, MP and Freeman of the Borough Pat Collins, ‘King of Showmen’, was based from the early 1900s at his Bloxwich Wakes Ground on the present ASDA site. He built a cinema, ‘The Grosvenor’ (later becoming an Odeon) on High Street, which is now a Wetherspoon’s pub named after him, ‘The Bloxwich Showman’. His home, Lime Tree House, remained until c1972. Bloxwich had an 1857 Music Hall (now used for sports), and three cinemas from c1912. The last, Pat Collins’ 1922 Grosvenor (later Odeon) closed in 1959 and has since had several uses. Bloxwich’s first (1861) police station was built onto the Music Hall and is now a school reception. The second police station (and library!) opened in 1874 and is now part of the Bloxwich Memorial Club. It was followed by Bloxwich Public Buildings in 1882-4, demolished in 2000 for the present Bloxwich Police Station, opened in 2002 by the Princess Royal. A new Bloxwich Library on the Pinfold was converted from a WWII ARP First Aid Station in 1948, itself being replaced by the present Bloxwich Library & Theatre (Bookmark Bloxwich) in 1960-64. The Bloxwich area was heavily developed for council housing from around 1925-39. Such housing expanded further during the 1950s-60s, mainly at Mossley, Beechdale, Lower Farm, Dudley Fields and Chepstow plus the Rivers at Blakenall Heath. Many private and housing association dwellings have been built in more recent years. Bloxwich Fountain in Promenade Gardens, the old Music Hall and ‘National’ (Church of England) School are visible in the background. Late 1920s. Bloxwich’s first purpose-built school was ‘The National’, built 1828 and rebuilt 1862 (now Bloxwich C.E. Primary). The first ‘Board’ school opened at Leamore (1872). Various others opened in the early-mid 1900s. Comprehensives arrived in 1958 (T. P. Riley and later Frank F. Harrison and Forest) and more primaries in the 1960s. Elmore Green High School (now Primary) became the T. P. Riley Annexe. T. P. Riley Comprehensive was replaced by Walsall Academy in 2002. In recent years there have been more changes. The Bloxwich Fountain was last restored and repainted, with new railings, in 2009-10. Today, Bloxwich is a pleasant, leafy place to live, semi-rural in places and with a range of attractive parks, playing fields and green spaces which add to its character, while still being proud to be part of the historic Black Country. This is just a taster article – more will follow, focusing on particular aspects of Bloxwich and district! Historic pictures courtesy Walsall Local History Centre. Modern pictures by Stuart Williams. Interested in local history? Watch this space! The Bloxwich Tardis on Elmore Green is a steel time machine celebrating the history and heritage of Bloxwich – but what do you know about Bloxwich past? The people of Bloxwich and district are well-known for their interest in local history and heritage, whether it be of people and places, pubs and parks, chapels and churches, or ghosts and goings-on in their own area. And both The Bloxwich Telegraph and its predecessor The Bloxidge Tallygraph are well-known for supporting that interest. Now, our readers can look forward to reading a range of local history articles penned by our editor, Stuart WIlliams – all within these pages. Some of these will be new, others will be updates or expansions of past features we have published over the years. First up will be a short potted history of Bloxwich, entitled Bloxwich – Then and Now. Watch this space! Seventeen mysterious carved wooden clubs, known as the Bayard’s Colts, have gone on open display at Walsall Museum, but members of the public will need to visit the museum above Walsall Central Library as soon as they can to take advantage of this rare opportunity, as Walsall Museum is now slated for closure on 31 March due to budget cuts. The ‘colts’ are thought be at least 300 years old but their exact age, origins and even how they got their name remain a mystery. Last year the museum received a £12,000 grant from the Arts Council to increase public awareness including commissioning an acclaimed play called the Tat Man Tales, family fun days and storytelling courses. The clubs were carried behind the Mayor in ceremonial processions at the openings of markets and fairs and on other civic occasions.The colts were hung up on the wall of the Magistrates Court in the Guildhall when the Walking the Fair tradition was discontinued in 1870. They were transferred into the care of Walsall Museum in the 1960s although continued to remain hung in the Magistrates Court, out of public view, before returning to the museum in 2012. They are now on show in the Changing Face of Walsall gallery. Sadly, following the full Walsall Council meeting on 26 February, the popular museum announced on Twitter that it would close on 31 March 2015. Museum staff thanked their visitors, donors and volunteers for all their support over the years. The thousands of artefacts held by the museum will be put into storage. A bid for Heritage Lottery Funding will be made to hopefully redisplay collections at some future time. Entrance to the museum, above the library in Lichfield Street, is free. It is open Tuesdays to Fridays 10am to 5pm and Saturdays, 10am to 4pm. A very special book about the men on the Elmore Green School Great War Memorial is now available again at a very special price (see below), exclusively from Blakenall Village Centre – but hurry, time is short! 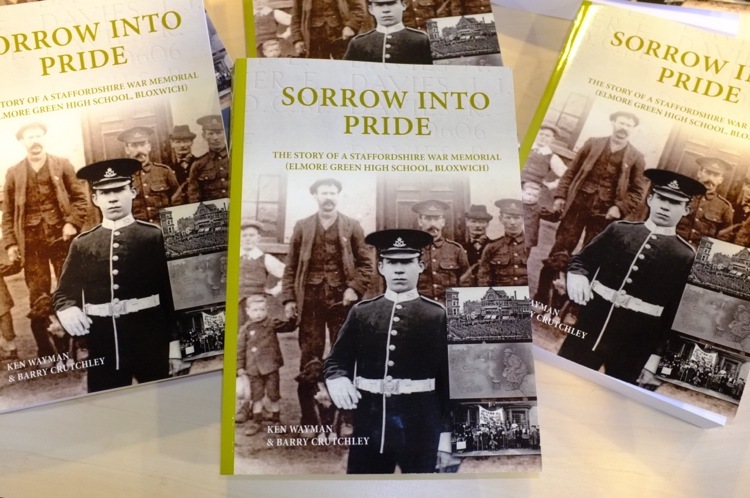 Sorrow into Pride tells the story of the social and military history of the ‘old boys’ of Elmore Green School, Bloxwich, who went off to fight in the First World War. 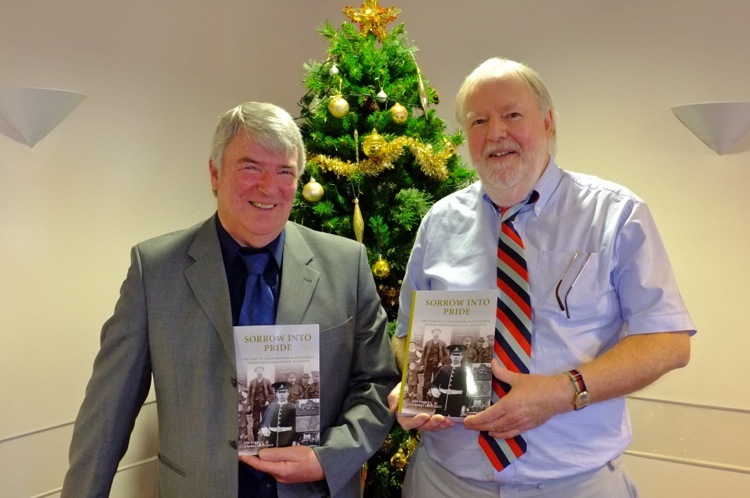 Written by two retired teachers and local historians, Barry Crutchley and Ken Wayman (pictured, above, at the launch), the book reveals the search for a ‘lost’ war memorial, the stories of the commemorated lads and its re-adoption by the original school. Elmore Green School Old Boys’ Association war memorial was unveiled in the school hall in 1922. It commemorated the sacrifice made by former pupils of the school in the Great War of 1914-18, listing sixty-seven ‘old boys’ of what was then Elmore Green Central School, later High School, who gave their young lives in “the war to end all wars”, some not passing away until 1919. It had been moved from the school in 1958 when the secondary functions of Elmore Green High School were transferred to the new T.P. Riley Comprehensive, not far away in Lichfield Road. The memorial quietly became part of the life of the new school until, in 2001, T.P. Riley was demolished and replaced by the present Walsall Academy, which opened in 2003. It was around this time that the finely carved marble sculpture by Bloxwich-born Frederick T. Perry “disappeared” from the public eye. In fact, it had been put into storage because it was not required by the academy, but for a long time this was forgotten. Over the following years, various people including Bloxwich local historians Edna Marshall, Barry Crutchley and ex-T.P. Riley history teacher Ken Wayman, had tried to find and raise the profile of the missing memorial and eventually, following convoluted enquiries via the Academy and within Walsall Council departments, in late 2010 it was tracked down to the premises of monumental masons A. Walker & Sons of Cannock, who had been storing it safely since the demolition of T.P. Riley years ago. 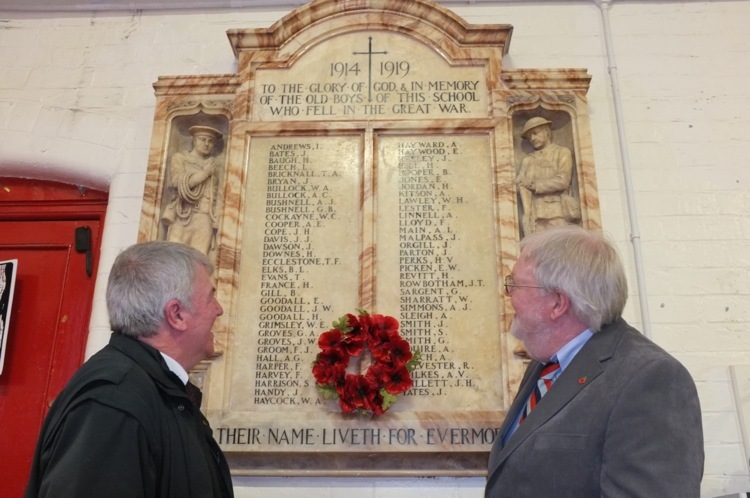 Following work done by Walsall Council officers Mike Gaffney and the now late Elaine Box, funding was found from the Council to have the memorial returned to its original home in March 2011, when it was mounted on the wall of the school hall by the masons who had preserved it. On Armistice Day that year, a special service of re-dedication was held at the school, truly bringing the memorial home. Barry Crutchley (left) and Ken Wayman ponder the men on the memorial. Sorrow into Pride traces the families and experiences of the lads named on the alabaster memorial, as well as one Old Boy who for some unknown reason was omitted from the list. In addition, the events leading to the deaths of ten servicemen closely related to those commemorated are examined, showing how the war affected their wider families; moreover, a number of related servicemen who fought in the Great War have been bound into the tale. Now re-adopted by the school community from whence it came, the war memorial has re-invigorated the local community and brought forward numerous descendants of the Old Boys, furnishing invaluable information, precious photographs and memorabilia. The authors owe a debt of gratitude to the present school community and its enthusiastic head-teacher Jane Humphreys, staff and pupils – following the hard work of local historians and council officers, they gave the war memorial’s story an unexpected happy ending. New Horizons Community Enterprise, which runs the Blakenall Village Centre and a number of local projects and activities, is proud to have sponsored the publishing of the book, which adds an important chapter to the history of Bloxwich and its people. The 458-page profusely illustrated softback book is published by Tommies Guides under the Reveille Press imprint with the ISBN: 978-1-908336-44-6. The normal retail price is £18.99 plus postage, but for a short period – until the end of April 2013 – signed copies of the books can be obtained for just £11.40 each or 2 books for £20, exclusively from Reception, Blakenall Village Centre, Thames Rd, Blakenall Heath, Monday-Friday 9am-5pm. Please note – cash purchases only. For further information and to order Sorrow into Pride, please contact Terri Wall, Service Manager of Blakenall Village Centre – email terri.wall@nhce.org.uk or telephone 01922 714900.